Austin leads SMI, the newsletter business he founded in 1990. With more than 38 years of experience in the investment business, Austin provides overall direction to the organization while continuing to author many articles for the SMI newsletter and web site. Before founding SMI, Austin started and ran his own investment management firm, which ranked in the top 5% of all investment advisers in the U.S. during its first five years of operations. He is the author of the Sound Mind Investing Handbook, A Step-By-Step Guide to Managing Your Money from a Biblical Perspective, which enjoys the endorsements of numerous respected Christian teachers and has sold more than 100,000 copies. Austin was once on staff with Campus Crusade for Christ, working directly with founder Bill Bright, helping to develop the ministry’s approach to working with high-capacity donors. He was a founding board member of Pro Athletes Outreach, a Christian training ministry to pro athletes and coaches of many sports, and The Christian Embassy, an outreach ministry to government and diplomatic officials in Washington, D.C.
Austin received an undergraduate degree in Banking and Finance from the University of Kentucky. He and his wife, Susie, have three adult sons and 10 grandchildren, and live in Louisville, Ky.
We've just updated SMI's Personal Portfolio Tracker and our monthly Fund Performance Rankings report to reflect mutual-fund performance data through Feb. 28, 2019. The Portfolio Tracker: The online Tracker personalizes SMI's fund rankings to your specific situation, making it easier to apply our momentum-based Fund Upgrading strategy to your 401(k), 403(b), or other retirement plan. The Portfolio Tracker filters the performance data of the 20,000+ funds we follow to produce a concise report covering only the funds available in your plan(s). Fund Performance Rankings (FPR): The FPR report is a PDF file containing month-end performance data — along with SMI's momentum rankings — for more than 1,600 no-load funds and ETFs. The funds included have been selected on the basis of asset size, brand familiarity, and brokerage availability. Robert Sharp, in his Lore and Legends of Wall Street, says that the investment usage of the terms “bull” and “bear” may date back to the California gold rush of 1848 when miners would entertain themselves with bullfights. It was probably inevitable that someone would wonder aloud how the bulls would do against the powerful grizzlies that roamed wild in the area. It wasn’t long before they were turning the bulls and the grizzlies loose in the same arena and betting on the outcome. Sometimes the bull would win by impaling the bear and tossing it up over his shoulder. But more often the grizzly emerged the victor by using its massive strength to wrestle the bull down to the ground, frequently breaking its neck in the process. The bull won by taking its opponent up, but the bear won by taking its opponent down. The terms were soon introduced in San Francisco, where active trading took place in mining shares, to describe opposing investors who fought to establish the direction of the market. We've just updated SMI's Personal Portfolio Tracker and our monthly Fund Performance Rankings report to reflect mutual-fund performance data through Dec. 31, 2018. The Portfolio Tracker: The online Tracker personalizes SMI's fund rankings to your specific situation. You can take the full universe of 20,000+ mutual funds we track and transform the data into a concise report covering only the specific funds available to you via your 401(k), 403(b), or other retirement plan(s). 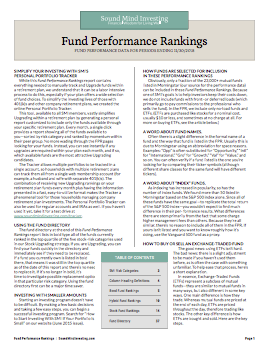 Fund Performance Rankings (FPR): The FPR report is a PDF file containing performance data, plus SMI's momentum rankings, for more than 1,600 no-load funds and ETFs. The funds included in the FPR have been selected on the basis of asset size, brand familiarity, and brokerage availability. Well, as I expected you would, you came through with a wonderful response. You didn't give just $15,000. According to my friends at the Jesus Film Project, 73 mission-minded SMI members collectively gave $17,564! As in years past, generous SMI members learned of a need and wanted to be part of the solution. Investing can be challenging, not because the concepts are difficult to master, but because we are emotional creatures. It used to read like ancient history, but many of us witnessed it first-hand in the tech-mania of the late-1990s, then again in the panicked selling of a decade ago. Because of human nature and our susceptibility to crowd influences, it isn’t unusual for markets and stock prices to become overvalued (or undervalued) from time to time. The graph below shows how investors’ moods swing in predictable patterns as prices rise and fall. At a bear market bottom, buying is triggered by an unexpected news event or financial report. The mini-rally is initially met with skepticism and caution. As buying continues, there gradually develops an increasing recognition of positive factors that had previously been ignored. The rush to invest leads to the launch of a new bull market. Confidence returns. As the bull market ages, optimism begins to outpace economic reality. Opinion overwhelms fact. A “buy on dips” mentality develops, reinforcing the uptrend. Euphoria sets in. Negatives are overlooked. There is a growing feeling that the old rules no longer apply. With no fear of loss, greed leads to a kind of buying madness. Buyers become fully invested. The bull market peaks. Selling is triggered by an unexpected news event or financial report. The selloff initially is treated as a healthy corrective. As selling builds, fear and doubt begin to surface. A growing rush to the exits leads to a bear market. As prices continue to fall, pessimism begins to outpace economic reality. Emotion overwhelms fact. A “sell on rallies” mentality develops, reinforcing the downtrend. Mental depression sets in. Positives are overlooked. There is a growing feeling that the old rules no longer apply. With no hope of gain, fear leads to a selling panic. Everyone who wants to sell has sold. The bear market hits bottom. Unfortunately, these stages are usually only obvious in hindsight. From 2009 through 2017, we saw Stages 1 through 4 unfold and enjoyed the ride. It appears we could now be in Stage 5, but it’s impossible to rule out that we’re still in Stage 4 (with more upside ahead) or Stage 6 (at the beginning of what could eventually become a bear market). The good news is we’ve been preparing for this for some time. SMI’s strategy toolbox has been updated with defensive approaches such as Dynamic Asset Allocation and the new Upgrading 2.0 protocols. If you’re using a blend that includes these strategies, your portfolio is likely prepared for what’s ahead, whenever it arrives. 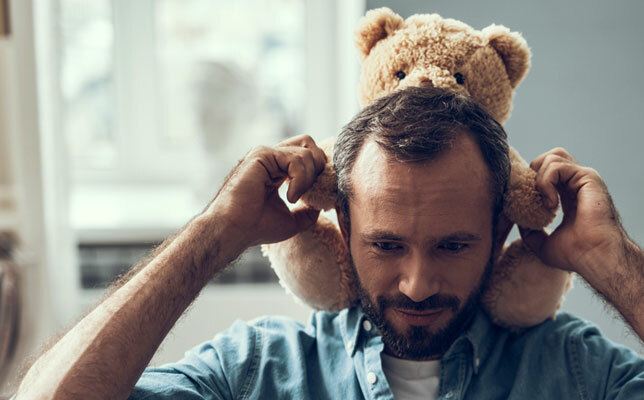 Knowing these strategies will guide us through future bear markets, we can confidently stay invested now rather than trying to guess when to exit. Having your portfolio prepared is half the battle. The other half is preparing yourself emotionally. Those with a short-term focus will be tempted to head for the sidelines because they’re worried about the curved line. Long-term investors, on the other hand, have the fortitude to stay committed because they’re aware of the power of the dotted line. Yes, an eventual bear market is inevitable, and it could be bruising. But ultimately, those with at least a five-year time horizon can continue investing with confidence — especially if they’re using SMI’s defensive-oriented strategies to do so.